I came home yesterday to find a gift on the front porch, and it was this diaper pail! It was so fun to get an unexpected gift...it makes it real that it is getting super close. I figure we may not be done with the nursery for awhile, since we'll be putting two cribs in there now. Apparently God has really focused on curing me of my need for perfection! My mom got in town tonight, because Will is having his first shower tomorrow at our church! I'm so excited she's here. And if you know the Rhonda, you know she came bearing a car load of baby and maternity stuff. She can't help it. It's like her crack. I know! It's been a week since we left for Pennsylvania, and I haven't written about our time there. I'm not going to lie. I did really well on the trip, but I have had such a hard time getting up off the couch since we got back! The trip was great. We got there very late Thursday night, and got up Friday morning ready to go meet Miss C. An impromptu trip through west Philly (Fresh Prince, anyone?) and a couple of hours later, we arrived at her house. I know you want details, but please understand that we would like to keep the majority of Miss C's identity and life to ourselves for now. We just feel it's not our story to tell; it's Will's. Someday he will know it all, and he will be able to choose what he wants people to know and what he doesn't. I will say that we had a great time meeting Miss C face-to-face, felt very comfortable with her, and left feeling like Miss C was very comfortable with her decision. We also got to take pictures for Will to have one day, so that was great. Saturday morning, before the 9 hour airport shuffle began, we were able to spend some time looking around Pennsylvania. We figured next time we won't exactly have time to go see the Liberty Bell! We went down and saw Independence Hall, the Bell, and the of course we had to go see "the Rocky stairs." And don't worry. The entire time I was there I kept talking about what Benjamin Gates would do. Unfortunately, they don't really let people up on top of Independence Hall. Anyways, it was a great trip, and we were so glad we got the chance to meet Miss C. It won't be long now! Tomorrow we are heading to Pennsylvania to meet Miss C for the first time. Although we talk on the phone every week, we are excited to meet her and get a chance to talk face to face. It's going to be a very quick trip, but we will be back up there soon enough! For those of you who may have wondered, yes, Miss C and our agency are aware of Baby McDeux. The time between finding out ourselves and the time we told them were probably some of the most nerve-wracking days of our lives! A lot of prayer took place for sure. Miss C's first response was very positive, as was the agency's. Since then, as expected, Miss C has had some questions for us. How we'll feel when the second baby comes, how we'll handle having two babies so young, etc. After talking through these questions with her, Miss C is still very comfortable with us, and we could not be more thankful! 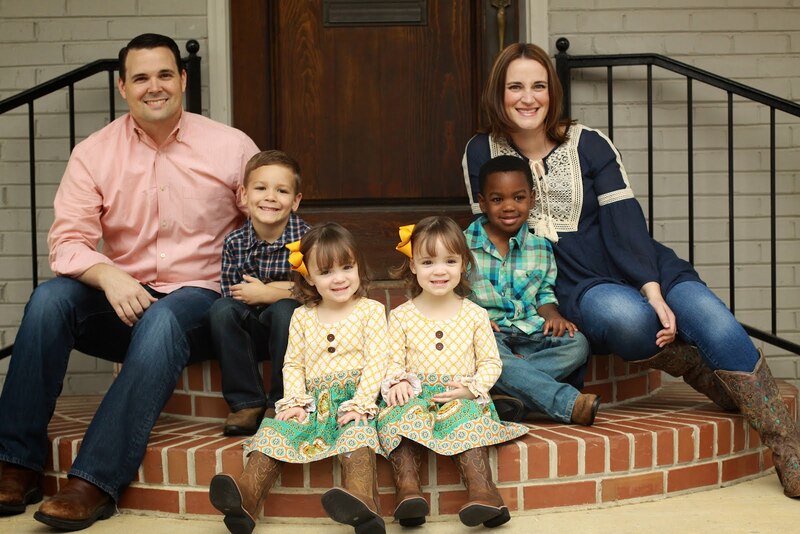 It is such a blessing to see God building our family in exactly the way He has planned! Last night, my mom sent me a text saying that pregnancy was getting in the way of my blogging. And she's totally right. If I am at home, I am asleep! It's something I'm working on, though. I keep telling myself it's okay, because I only have a month or two left to sleep before a very small person starts demanding my attention at all hours. Speaking of Will, check out his new onesie from his grandma...I love it! Nobody in the Midsouth knew it was coming, but we woke up Monday morning to a SURPRISE SIX INCHES of snow! It wasn't a good day to be a meteorologist here, I tell you. It was a great snow day, though! I hear my friends in Texas are getting a whole lot of snow right now, too. What a crazy winter! Mike helping with the neighbor's snowman. The snowman smiling at us from across the street. 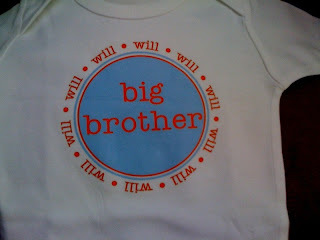 Looks like Will is going to be a big brother MUCH sooner than we expected! For the past 11 days, Life Action Revival Ministries has been at our church for a summit. I think at first most people didn't really know what to expect, but I can say that after these 11 days God has done an amazing work in so many lives and in our church. I know in my own life, God convicted me of complacency. Of doing what I had always done or making excuses for not spending more time with Him. I am sad to see the team go, but I am looking forward to seeing what God has in store for our church in the coming months! When the team comes, they bring quite a few people with them. So, for the past two weeks we have had three girls staying in our home. They leave tomorrow, and it will certainly be quiet without them. Mike's going to have to start talking more. Every Friday, I talk to Miss C, Will's birthmother on the phone. Well, imagine my surprise (and maybe a little panic) when she answered the phone this Friday and said she was in the hospital! From the beginning of her pregnancy, Miss C has been having some gallbladder problems. They have been getting worse, and now her appendix doesn't look that great either. So, when Will is born he will be born by c-section, and then they will take out her gallbladder and appendix as well. Talk about a crazy surgery! So now, the problem is when he'll be born. She is currently about 28 to 29 weeks, and obviously the doctors and everyone else would like her to make it as far as possible. April would be great, but at this point we just don't know. Please be in prayer for Miss C as she tries control her pain and that she will be able to hold on as long as possible. So far, according to doctors, Will has not been affected at all. He is perfectly fine in there, and he is currently weighing in at almost three pounds. So, please pray that he will continue to be unaffected, and that he will get to bake as long as possible.